For me, archways equal climbing roses. A major gardening confession - I have little imagination or confidence to grow anything else over the arches in the garden. There are good reasons for my lack of vision. The advent of the Moosey archways coincided with my first great rose phase. 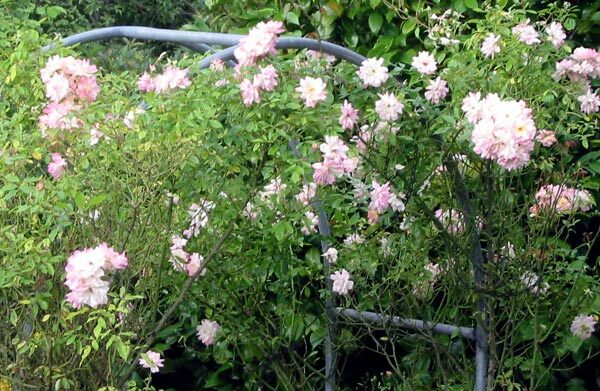 It was just too tempting to be able to choose and plant climbing roses, and wait for the promised displays of supple canes dripping with fragrant flowers. Sadly, my archways are still monoflorific, if there is such a word, and the dripping flowers on some have been rather an anticlimax. 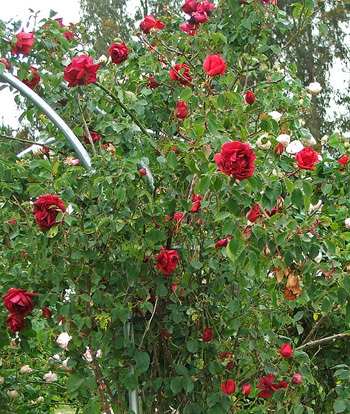 Several roses have actually failed, and others are growing too slowly. The rose canes are occasionally well tied in, but the plants around the bases have got out of control. Forgotten pruning sessions come back to haunt me as I struggle under an archway with a full wheelbarrow and actually get stuck. Good gardening intentions are sometimes not enough. If ever it seems that my archway plantings are uninspired, I've always used the excuse that the garden is too windy (for summer flowering clematis), or too frosty (for evergreen foliage climbers), or just not suitable. The truth is that I'm a wimp. I've chosen to remain ignorant of archway possibilities. I don't even manage to get the sweet peas organised in time. The large flowered clematis are tempting, but I don't try them. Roses rule. The ultimate irony lies in my Golden Hop which was planted in the garden over the water race to hide a large tree stump. 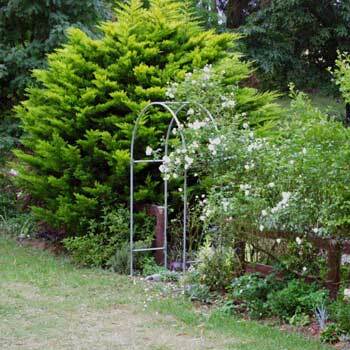 This plant would have covered five archways with its vigorous vines, if I'd had the gardening sense to provide such. Instead it goes marauding over the ground in its border, covering and smothering all neighbours. Maybe in the gardening future I'll pluck up courage and try some other climbers on a Moosey garden arch.